Thank you One World Music Radio!! Paul Brown, April Brown, and Agrelia's Castle just won 3 Awards - for Best New Age Album, Album Of the Year and the People's Choice Award!! Thank you ONE WORLD MUSIC and all of the people who have supported this couple, and this wonderful album! In celebration, throughout July 2016 - Mysterium Music will donate 50% from each copy of Elders & Ancestors purchased to charity! Stay tuned for a special giveaway announcement! Mysterium is welcoming GRAMMY® Award winner Micki Free to the label for the release of his next Native American flute album titled The Native American Flute as Therapy in October 2016. The album, incorporating a unique blend of flute, spoken word and instrumentals, promotes relaxation and enlightenment. The collection will feature among its spiritually-uplifting song titles “White Candle Light,” “Scented Oil,” “Positive Energy” and “Pressure Points.” He recorded “The Lavender Touch” on the day Prince passed away, and renamed it “Lavender Kiss” as a soulful lament for his friend, in the legend’s honor. 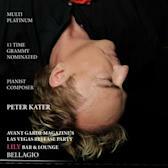 Peter Kater is the featured cover story for AVANT GARDE magazine's April 2016 Edition: "The Spiritually Creative Artist" Read here! Los Angeles, CA (December 7, 2015) – One might think that having ten previous GRAMMY® Award nominations would mellow Peter Kater’s excitement about the GRAMMY Awards, but to him, every album is unique, every nomination an honor. This year, his peers in The Recording Academy nominated Love for Best New Age Album for the 58th Annual GRAMMY Awards, to be aired on CBS at 8 p.m. on Monday, February 15, 2016, live from Los Angeles, CA. Love is the artist’s first solo piano album in over a decade; it was released by Mysterium Music (Hanover, PA) on May 5, 2015. LOVE Garners 11th GRAMMY® Award Nomination for Peter Kater, nominated for Best New Age Album in the 58th Annual GRAMMY Awards. Speaking from his Santa Monica, CA home, Kater shared, "I’m so excited to be once again nominated for the prestigious and elusive Grammy Award. I really barely slept last night in anticipation of this morning’s announcements. I’m very moved by the support of my peers and touched that a solo piano album so close to my heart and so essential to my creative expression has received this great honor. In this album, I feel that I was able to express what is deep within my heart where words fell short and seemed colorless in comparison. After all, what is more compelling, alluring, mysterious, powerful and transformational than LOVE?" Love is a collection of seven composed pieces and six improvisations that share the common theme of love and its many wonders and emotions. Captured over a period of three years, the album is romantic yet poignant, with lush graphics and liner notes bordering on poetic. Kater bares his soul, explaining the basis or inspiration for each piece, giving deeper and more personal insight into the music. Alone at the piano, he explores the many facets of love, not just the more common musical themes of romance and infatuation. He also encompasses hurt, loss and healing as well as the love of self - a much more mature approach that translates beautifully into Peter’s unique and distinctive musical language. The year 2015 has been a highly meaningful and memorable one for Kater. Just before releasing Love, the horrific earthquake in Nepal occurred on April 26, and Kater immediately decided that the release of Love should serve a higher purpose. With the full support of Mysterium's founder, Trisha Bowden, the label donated all proceeds from the album's first week of downloads to the American Nepal Medical Foundation's 2015 Earthquake Relief Fundraising Campaign. In May, Kater was honored with the esteemed Lifetime Achievement Award by the Zone Music Reporter Awards & Gala in New Orleans, and feted by friends from around the world in a touching tribute video ( https://youtu.be/lmuY52rGayA ). In July, Kater joined Nawang Khechog (Tibetan Flute) and Michael Fitzpatrick (Cello) in creating a musical “Long Life Prayer” in honor of His Holiness the 14th Dalai Lama’s 80th birthday, produced by the Panchen Lama Tashi Lhunpo Project ( https://youtu.be/mTIQvYpDBBE ). Bowden commented on the nomination this morning, saying, "It is with great honor we salute Peter Kater on his 11th GRAMMY nomination. The incredible depth of his creativity, and his devotion to meaningful and compassionate causes close to his heart, brings a beautiful energy to the new age music community and to Mysterium Music. We are truly Blessed to share his Love album with the world." Love is Kater's fourth recording with Mysterium Music, the Hanover-PA based label founded by vocalist Trisha Bowden for the creation and networking of music for the healing arts and integrative medicine. Mysterium’s music is in use for hospice care and in cancer centers, and in the treatment of PTSD and sleep disorders among many other modalities and health care areas. The label has received multiple awards in the area of healing/meditation music, now totaling four GRAMMY Award nominations with this year’s nod to Love. Mysterium's first release with Kater, Light Body, was both GRAMMY nominated and awarded Best Relaxation Meditation Album by the Zone Music Radio Awards. Light Body was followed in 2013 by Illumination, which earned Mysterium its second GRAMMY Award nomination (and Kater, his ninth.) In 2014, Kater reunited with acclaimed Native American flutist R. Carlos Nakai for Ritual, their first collaboration in over ten years, resulting in a third GRAMMY Award nomination for Mysterium, and a win for Best Contemporary Instrumental Album at the Zone Music Awards. The GRAMMY-nominated album, Love, is for sale as physical CD or digital downloads from Mysteriummusic.com, Peterkater.com and fine music stores everywhere, including but not limited to Amazon, iTunes and CD Baby.